DARRS, Inc.’s multiple graded stakes winner Honorable Duty “couldn’t look any better,” according to his trainer Brendan Walsh, as the classy 6-year-old gelding continues to train to defend his crown in the Sept. 29, $200,000 Lukas Classic (Grade III) at Churchill Downs. Honorable Duty, the son Distorted Humor, charged home to a 4 ¾-length win in the 2017 Lukas Classic but tailed off form at the end of the year with a last-place finish in the Fayette Stakes (GII) at Keeneland and pulled up on the far turn of the Clark Handicap (GI) at Churchill Downs. 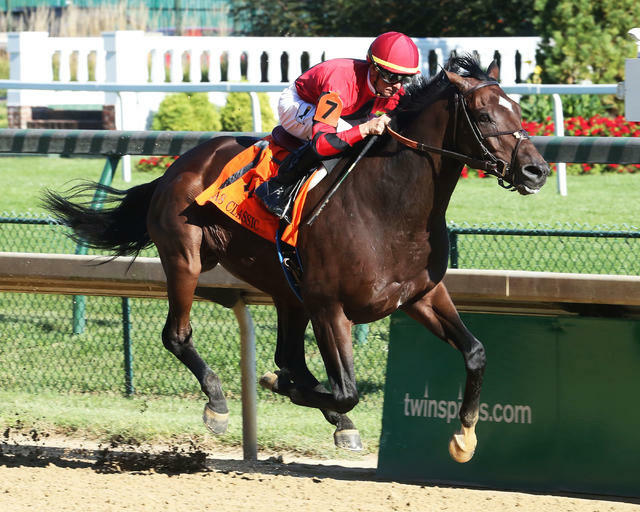 Honorable Duty began his 2018 campaign with a five-length romp in a conditional allowance race on May 20 and a second-place effort behind Pavel in the June 16 Stephen Foster Handicap (GI) at Churchill Downs. The probable favorite for the Lukas Classic is one of the nation’s top sprinters Mind Your Biscuits, who has multiple Grade I victories and earnings topping $4.15 million. The colt is prepping in the 1 1/8-mile race for a start in the Breeders’ Cup on Nov. 3 at Churchill Downs. Walsh has not ruled out the possibility of Honorable Duty making a start in the Breeders’ Cup Classic (GI) but said the eight-time winner would have to “run off the screen” for him to consider entering the Nov. 3 Breeders’ Cup. SATURDAY WORK TAB FILLED WITH POTENTIAL BREEDERS’ CUP CONTENDERS – There were 145 horses on Saturday’s work tab at Churchill Downs that included possible Breeders’ Cup contenders Promises Fulfilled and Mr Freeze for trainer Dale Romans. “It was like murderer’s row after the break with all of the stakes horses,” Romans life partner and exercise rider Tammy Fox said. One of the nation’s top sprinters, Bob Baron’s Promises Fulfilled, returned to the work tab with a half-mile move in :48.20 following his 1 ¼-length win in the H. Allen Jerkens Stakes (Grade I) at Saratoga. Working in the set after Promises Fulfilled was late-blooming 3-year-old Mr Freeze, who clipped through five furlongs in 1:00.40. The West Virginia Derby (GIII) winner is preparing for a start in the Sept. 22 Pennsylvania Derby (GII) at Parx Race Course. The colt is possible contender for the Breeders’ Cup Classic (GI), according to Romans. Scheduled to breeze Sunday at Churchill Downs is Longines Kentucky Oaks (GI) winner Monomoy Girl. The filly, who is one of the top contenders for the Breeders’ Cup Distaff (GI), is slated to work at 7:30 a.m., according to trainer Brad Cox. MENA BACK WORKING HORSES AFTER FRACTURING RIGHT ANKLE AND HEEL IN MARCH – It has been a welcomed sight for many horsemen and jockeys on the backstretch of Churchill Downs as journeyman rider Miguel Mena returned on horseback after fracturing eight bones in his right ankle and heel six months ago. Mena was injured March 15 at Fair Grounds when his mount clipped heels in the stretch run of a $5,000 claiming event. A winner of 1,844 races in his 16-year career, Mena has already breezed several horses at Churchill Downs including Risen Star (Grade II) winner and Travers (GI) third Bravazo for D. Wayne Lukas. “It amazes me how much bigger and stronger he’s gotten since the last time I was on him,” Mena said. The 31-year-old Peruvian hopes to return to the races in the next month. DOWN THE STRETCH – There is a $52,391 carryover in the 50-cent Pick 5 (Races 7-11) and $8,875 carryover in the 20-cent Single 6 Jackpot (Races 6-11) on Saturday’s program at Churchill Downs. The Single 6 sequence begins at 3:16 p.m. (all times Eastern) and the Pick 5 gets underway at 3:48 p.m. … Friday’s kick off of the September Meet featured a different jockey and trainer winning every race. “Well, I guess I’m tied for leading trainer,” veteran conditioner Rick Hiles joked following Rose of Malibu’s win in Race 6. … The podcast of ‘Inside Churchill Downs’ that aired Friday with trainers Ignacio Correas IV and Chad Summers along with private clocker and bloodstock agent Brandon Stauble is available at: https://bit.ly/2Opccsa.